We’re spending three months in Berlin soon, so it’s about time I know some cool things to do while we’re there. We’re not so much into sightseeing or endless wandering around museums, but we love to get random crash courses in culture and city life. 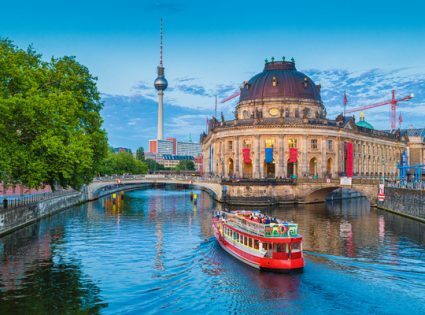 Here are some of the things I’ve read that you can do in Berlin that catch my fancy. Supposedly, there’s quite the ping-pong culture in Berlin, with neighborhood parks usually housing an all-weather table. There’s also a legendary bar called Dr. Pong where some happening youngsters play ‘killer pong’ from midnight until daylight, along to a range of eclectic beats. Hot pork sausage swimming in curry ketchup… I’m sorry but my taste-buds aren’t really fighting to get their fangs into that one. Here’s a bit of trivia for you though, supposedly 800 million servings of Currywurst are sold in Germany every year. The East Side Gallery is a 1.3km stretch of the Berlin Wall with paintings and murals from artists all over the world. A walk over the Run Lola Run bridge, Oberbaumbrücke then takes you to the ‘hip’ part of Berlin, Falckenstein Strasse/Schlesische Strasse area of Kreuzberg. See the sights of Berlin from a new perspective. Kart 4 You offers tours of Berlin by go-kart! How cool is that? €49-59 for three hours is a bit expensive, but just imagine roaming around real streets in a go-kart. Alternative Berlin has a few different tours to suit your taste. The one that jumps out at me is their ‘Street Art Workshop’ where you have a walking tour of the back streets first then get your hands dirty by trying out your own graffiti skills. There are a series of wine shops, called Weinerei, where you pay €1 for a glass and then help yourself to a variety of wines (sometimes as many as 20!). Ask what’s on the menu for that night and if it’s up to your alley, stay for a feast and then leave an amount that you think is fair in the bucket on your way out. And to top it off, even more, I heard that apartments in Berlin are lighter on the pocket compared to the rest of Western Europe. Committing to a medium-term stay of 2-3 months is usually a lot cheaper than staying by the night at hostels or hotels, to read more about this check out our previous post on How to Find Cheap Accommodation.